She's Fantastic: Kre-O G.I.Joe BARONESS! There's nothing more disappointing than getting priced out of a hobby you love. My female action figure hobby started with G.I.Joe characters. As a kid, I was obsessed with all the amazing ladies on the show; Scarlett, Lady Jaye, Cover Girl, Baroness, etc etc. As a collecting adult, I assembled them all into my collection (even the uber-rare Glenda). But in the past few years, there have been just too many convention exclusives, club exclusives, etc that have left me deflated. I am many figures behind: All three Jinx's, Daina, Night Force Lady Jaye, Ravage Baroness, Crimson Asp, and all the Club Exclusives - Cover Girl, Jinx, & Quarrel. They cost a fortune in the secondhand market and are just out of my league. I pretty much gave up on the brand. That is, until the Kre-O line was announced last year. Finally some affordable Joes! The Kreons aren't as charming as Legos or Mini-mates, but they are pretty cool. I was also very glad to see a future Lady Jaye figure shown at ToyFair this year. Now we just need Zarana and Cover Girl to round it out. Let's check out Baroness below! 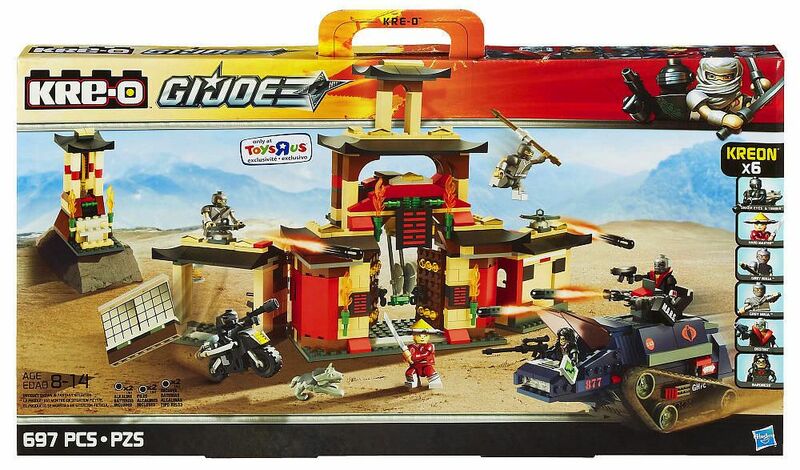 While the Scarlett and Jinx Kreons were affordable, Baroness came in a giant $80 play set called Arashikage Dojo. Luckily she's pretty easy to snag on eBay loose. The only flaw with Baroness is that her hair (on mine at least) wants to rise off her scalp. It's made of a softer plastic than the rest of the figure and has a certain tension to it that makes it want to squeeze and rise off the top of her head. I find that raising her head on the neck post a little bit can remedy this. Baroness comes with a 2-piece rifle that snaps together and closely resembles the rifle that the vintage Baroness figure came with. Here she is with Jinx and Scarlett. And here she is with Arcee and Airachnid. Baroness is awesome! Such a cute little figure. Very tempted by this line. I remember seeing a Youtube video showing you can swap Scarlett's hair with a Lego Friends figure named Mia & she looks heaps better. I've managed to keep up with the 4" GI Joe women. I did look on eBay a few times for vintage Glenda as I have Quarrel, but yeah, she is usually going for a bit more than I am willing to pay! Search for the vintage Canary Ann for a ridiculously rare Joe woman. Was stoked I managed to get the Transformers set with Baroness.It is her best figure by far. Soo need those Kre-O Arcee & Airachnid figures too! Thanks for the Scarlett advice.. i just bought two different red hair pieces on ebay (the second one is from "City Space Girl"). I got my Glenda surprisingly cheap about 10 years ago from Argentina. (she was going for about $400 mint at the time, but i got her shipped for less than $50). The chrome on her crotch piece is a little tarnished, and her elbow is glued, but she has her accessories and looks great. I haven't had her displayed for years unfortunately. Your SDCC Baroness is amazing. As is your Night Force lady Jaye. I'm actually more jealous of lady jaye becuase knowing hasbro, that baroness will probably be released again with some minor tweaks. I've always loved ravage though, so I'll probably spring for the original soon. I really want more kre-o Transformers. Chromia seems like she'd be a shoe-in. Canary Ann blew my mind.